In petrol engine, about 30-40% of the energy contained in the fuel goes waste in the outgoing exhaust gases. A turbocharger, which employs a centrifugal compressor as a supercharger and a turbine wheel, makes use of a part of the energy contained in the exhaust gases. The energy extracted from the exhaust gases is also utilized to drive the compressor. As the turbocharged engines, due to higher peak cylinder pressure, are more prone to detonation, the compression ratios have to be reduced, which reduces air standard efficiency. Moreover, the performance of the turbocharged engines is not improved at low engine speeds. As such their use in petrol engines is limited. 1. Power output of a given displacement engine is increased. 2. Torque characteristic of the turbocharged engines is better. 3.Turbocharged engines have more B.P. /weight ratio, compared to mutually aspirated engines. 4.Power loss due to decrease in air density at higher attitudes is reduced by using turbocharger. 6. Reduced noxious exhaust gas emissions. However, a turbo-charged engine requires good maintenance of engine oil, oil and air filters, as any dirt in oil and air can cause failures. Although the supercharger and turbocharger perform the same function, yet the difference lies in the power supply to drive the same. The supercharger is driven directly by the engine through a belt; as such the useful engine power gets reduced by that amount. On the other hand, there is no such power loss in case of a turbocharger which gets its driving power from exhaust gases only. 1. To reduce weight per horse power of the engine as required in aero engines. 4. To improve volumetric efficiency of the engine at high altitudes as in aero engines and at high speeds as in racing cars. 5. To maintain the power of a reciprocating IC engines even at high altitudes where less oxygen is available for combustion. 6. The supercharger is normally activated on demand, when the accelerator pedal is pushed to the floor. Exhaust gasses from the engine flow along the exhaust manifold and through nozzle box assembly and enters into the blades of the gas turbine where the mechanical work is done by the gas turbine. 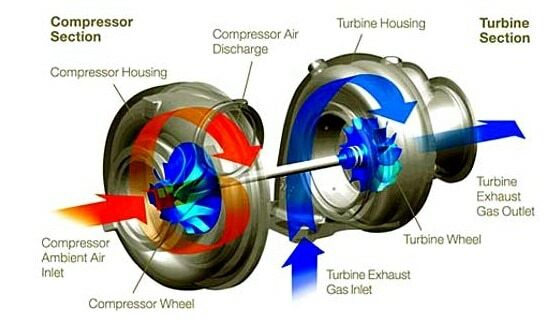  As the turbine turns at high speed, it causes the compressor to compress the atmospheric air incase of diesel engine or air fuel mixture in case of the petrol engine and enters the engine cylinder. In both systems, air enters through an air intake, passes through an air cleaner, and travels through a duct (usually funnel shaped) to the compressor inlet portion of the turbocharger.From there air is forced through a diffuser into the intake manifold, to the individual cylinders. The most critical problem is controlling the manifold or boost pressure. This is the amount of additional boost or pressure created by the turbocharger. The boost must be controlled or the engine will begin to detonate and eventually burn holes in the pistons and self-destruct. The solution lies in the waste gate or safety valve, which is keyed to intake manifold pressure, exhaust pressure, or a combination of both. At a predetermined pressure, the waste gate valve will open, allowing some of the exhaust gas to pass directly into the exhaust system bypassing the turbocharger. This keeps the intake manifold pressure at a preset maximum. 1. Improved torque at low rpm in the case of diesel engines and over a whole speed range in the case of petrol engines. 2. Better mixing of air and petrol in the case of petrol engine resulting in effective pollution control. 5. Ease in starting from cold. 7. Improved horsepower in the case of both petrol and diesel engines. 3. Wear and tear is at a faster rate.